February | 2013 | Poverty, Agony, Distress & Want! Can it be that time already? Yes, clearly it can. It is amazing how quickly time goes by when you least expect it to. I mean, didn’t we just start the new semester? How could March Break be next week? Well, it is and it’s not like I’m complaining or anything; far from it. I could actually use a break. I know, poor teacher, what to do with all those holidays. I really am tired though…verging on burnout. It has been a crazy month; no wonder the time has gone by so fast. Oh well, I’ll have my little break, feel better and be in the same boat I am right now in another month. Isn’t life great? Hey, so I’m back. Yes, I took a little vacation from the blog last week as I needed to do a lot of catching up and there wasn’t a whole heck of a lot to say. This week has been a bit more eventful and I will regale you will all the details. So I decided to skip a post last week (I’ll probably be doing that more often) since I had just come back from my trip to Minneapolis and really had not done any railway related stuff in that time. The Glazier Clinic was awesome, as it usually is. It was a nice blend of learning, relaxation and fun. I spent most of my time with two presenters; Matt McCarty from Northwestern College and Mike Duffner from the Jacksonville Jaguars. None of the information was earth-shattering, but every little piece of new information helps. I certainly have a number of new things for next season and I can’t wait to try them out. As I previously mentioned, school has been humming along, at breathtaking speed albeit. I’m still trying to cope with the challenges of my new classes, in particular the eLearning class. It’s just very weird not being in front of a class, facilitating rather than teaching and marking someone else’s assignments. Doesn’t really give you a feel for the course…it’s like going through the motions. I guess it just takes a little getting used to, but it is such a radical departure from what I’m used to. The students seem to be doing a good job and I’m very impressed with their learning and discussions. 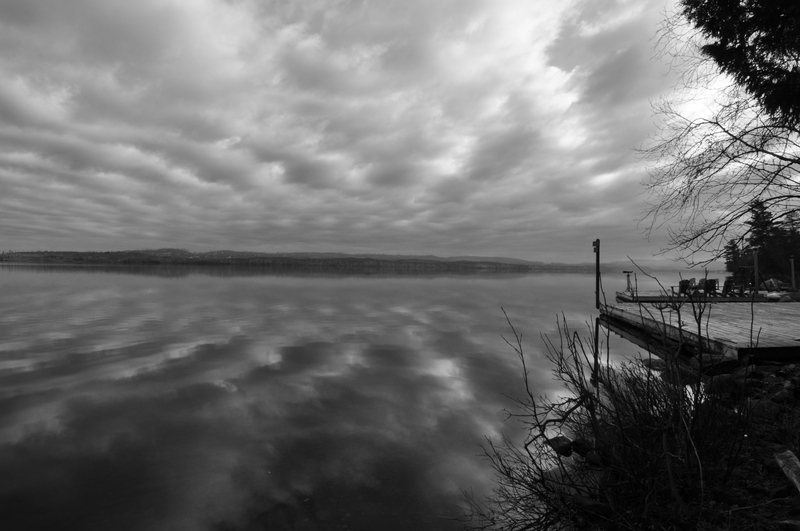 The weather lately has moderated some, reflecting more seasonal temperatures. I took the boys up the mountain on Sunday for only our second hike of the winter. It was gorgeous outside; I even felt hot with a toque, cold gear compression shirt and spring jacket. We did a different circuit this time, just for a little bit of variety. It was nice to see a few different things. Boy did my legs hate me afterwards though; I was one sore boy! Even just pulling the boys on the flat parts is a challenge and they are going to have to do more walking in the future. 105 pounds is a lot to handle! 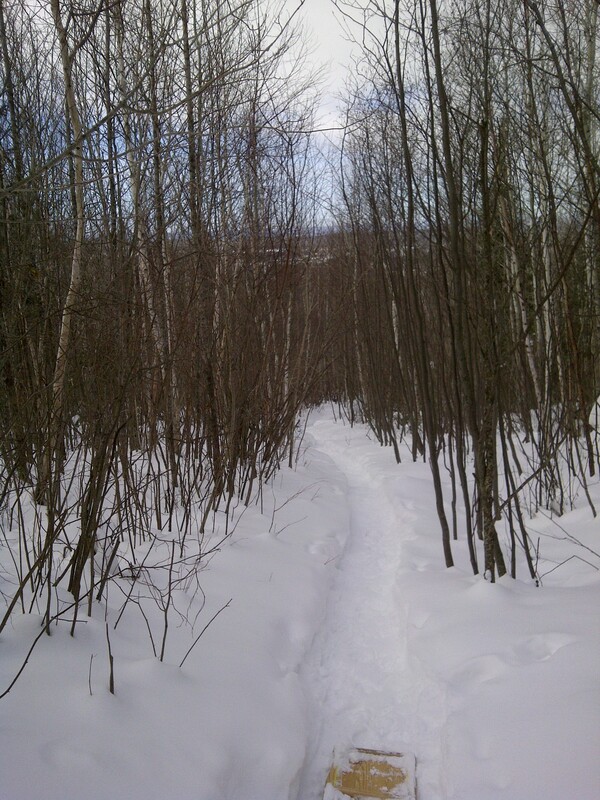 Going up the trail, February 2013. In the Nor’westers, February 2013. So in the last week I haven’t done a ton of railway stuff per se, but there has been things going on. Maybe in the next few weeks I’ll be able to get back to some research. The real excitement has centred around the Silver Mountain Historical Society. On Saturday I received a message from my society co-President Shelley Simon to get in touch as she had some urgent info. However I was out for a much deserved dinner with my wife so I had to wait until morning to get the awesome news; on Saturday afternoon the Ontario Historical Society had incorporated us a non-profit organization. We are official! This is very exciting news and allows us to move forward with our membership and projects. It will be a very busy spring! You can read more about the process on the society blog. It simply amazes me the things that the human body can do…what a wonder of engineering we are! The body’s ability to take abuse and then bounce back is astounding. Unfortunately, there is always a price to be paid for such resilience, and it usually involves pain. It’s just a not so subtle way of saying to you that you’re a dumbass for putting yourself through some sort of self-imposed torture. I’m seemingly a poster-child for this type of stupidity! Needless to say it has yet again been a very busy week, and it appears that it is shaping up to be even worse this week. How can it be the second of week of the new semester and I’m already burnt out? Maybe work, a new class, open house, football and railway stuff might have something to do with it. Hopefully next week is a little more sane. So much of my stress has been generated by the new class that I am teaching which is an online, “eLearning” class. I spoke about it last week, but I haven’t really been able to get a real sense of it until yesterday when it officially began. It’s not that it’s overly difficult, but the content is new and it’s a very different medium than I’m used to. Probably most of my headaches stem from the fact that I am a worrier and I am constantly wondering if I am doing a good job or handling things correctly. Hopefully I will feel more comfortable as the semester progresses. There are two big events on tap this week that will be absorbing most of my attention (and unfortunately leaving very little railway time). Tomorrow is our school’s annual open house, an opportunity for us to showcase our fine establishment to next year’s new students. It all over in an hour or so, but it takes quite a while to set everything up. There is also the challenge of trying to incorporate new ideas and keeping things fresh; no wonder I feel like I’m totally bagged! I’m sure it will all be fine, but I will be glad when it’s done. Immediately after the open house is done I have to rush home and pack for another out-of-town excursion. On Thursday after school, myself and my fellow football coaches will be departing for Minneapolis to attend the annual Glazier Football Clinic. Glazier is probably the largest provider of coaching clinics in the US; the event in Minneapolis alone has over 150 sessions delivered by coaches from many different levels right up to pro. I’m looking forward to some great information on 3-5 defenses and linebacker play. If you read last week’s babble you’ll know that the big event in the past week was the presentation I gave at Gunflint Lodge. I had been invited by Sue Kerfoot to give the talk back in September, so it was a long time in coming. I was very excited for the event, but as I normally am with things like this, very nervous too! I decided to leave from home early on Saturday morning as there was a chance of snow and I wanted to take my time in case the roads were bad. It’s about a 2 hour, 45 minute drive to Gunflint on a good day, so I figured I’d have plenty of time to get there. I had time to burn lest I arrive too early, so I stopped in Grand Marais to snap some photos of the harbour. Pulling in to Gunflint I stopped for the first time at the lake overlook just off of the trail and got some good shots of the narrows between Ontario and Minnesota. 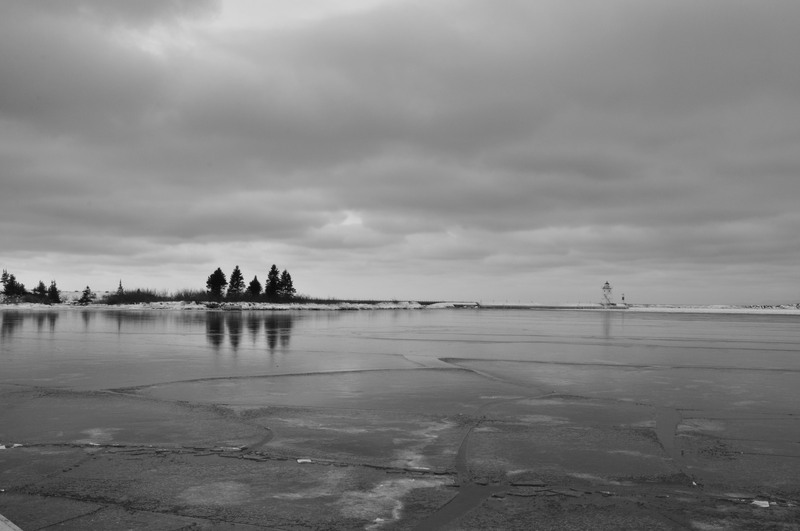 Grand Marais Harbor, February 2013. When I arrived at the lodge my cabin wasn’t quite ready, so I chilled out in the Red Paddle Bistro, sent some emails, updated my Facebook and had a bite to eat. 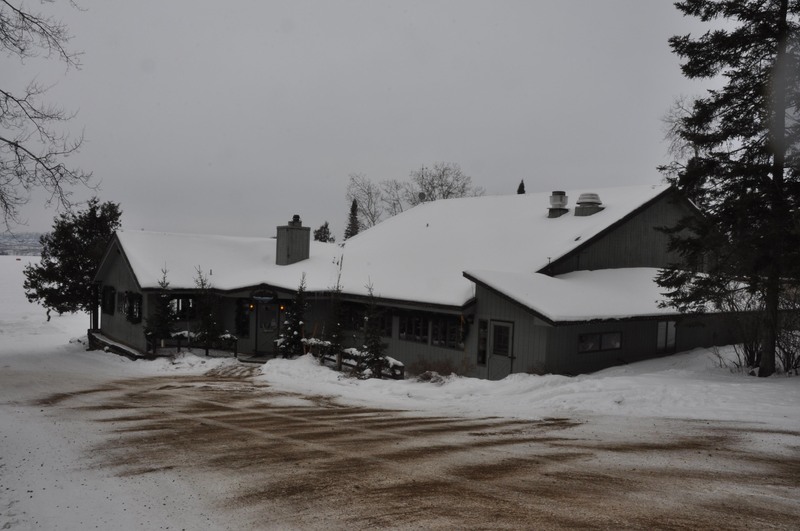 The lodge is quite the beehive of activity, even if it is winter. 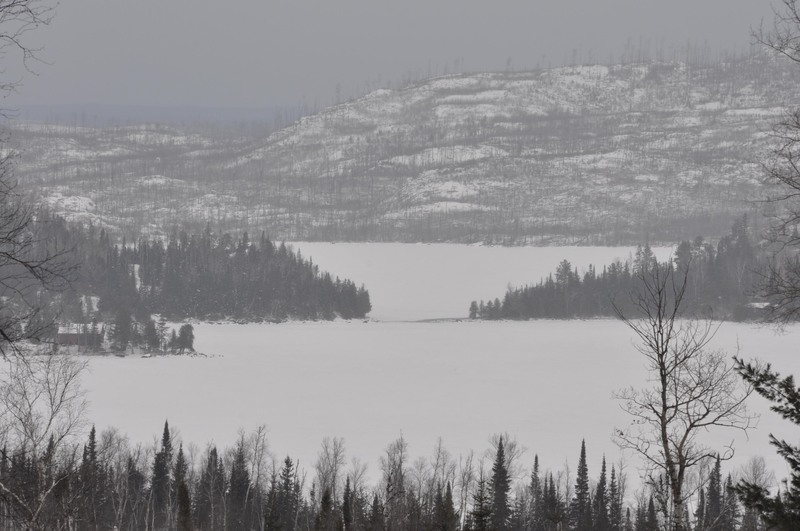 There were a lot of people coming and going, heading out on the lake to snowmobile or snowshoe. It made me think of how we take our surroundings for granted too often and how people pay a lot of money to experience what we have. 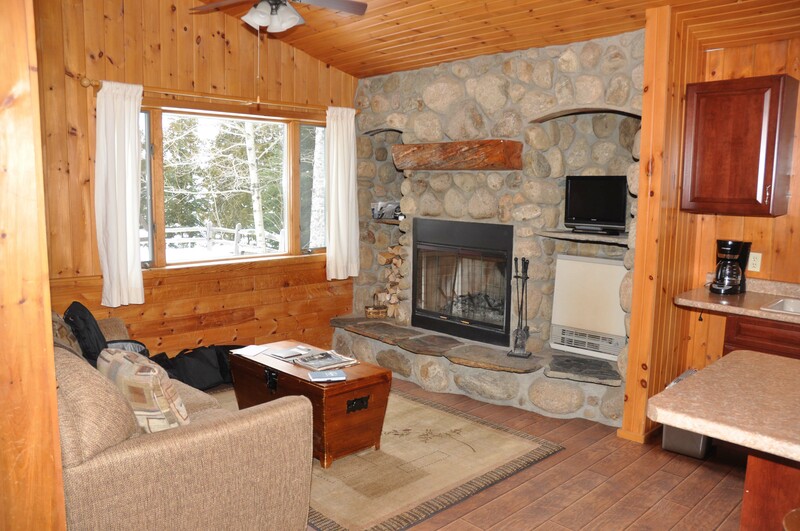 Cabin 20, Gunflint Lodge, February 2013. 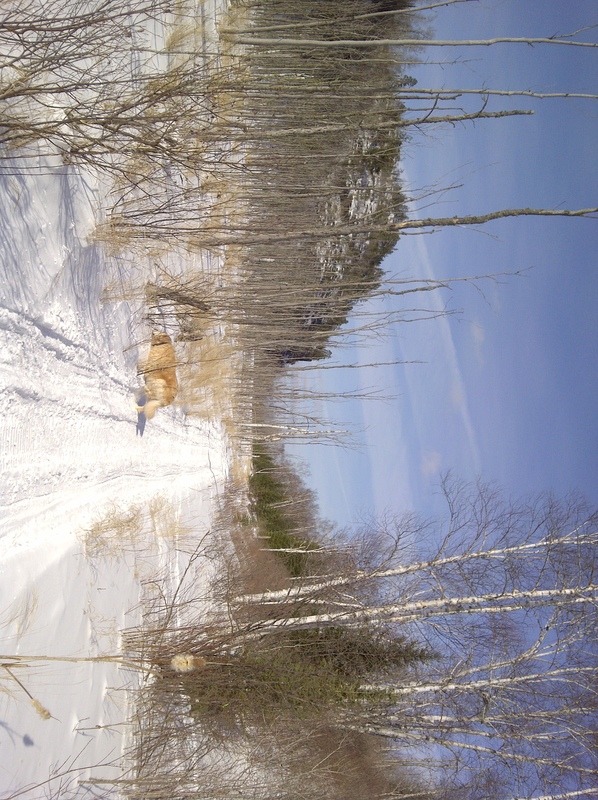 So I began my little journey in good spirits, happily trudging along the snow covered ice between the fishing shacks and snowmobilers. The going was a bit tough, as there were a few inches of snow on top of the ice that made each step a challenge. My GPS told me that the Canadian shore was a scant 1500 metres away…child’s play! That’s the distance I cover when I walk the dog and I’m not worse for wear. 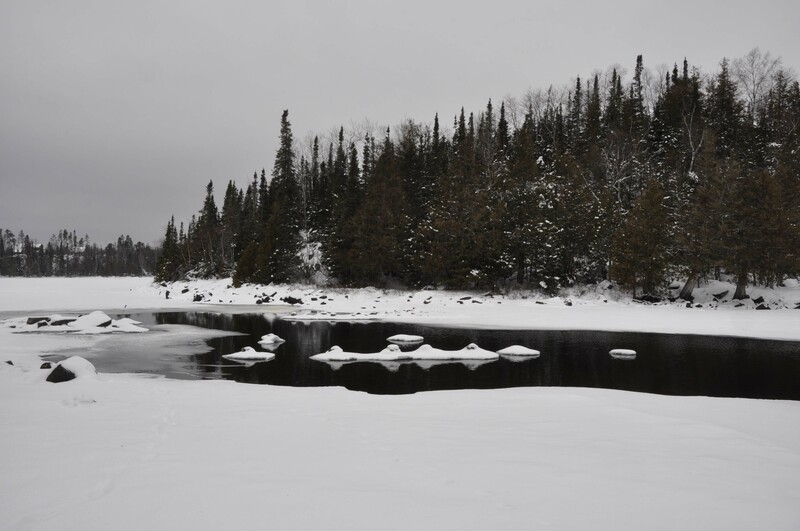 As I tromped along I became acutely aware of how much colder it was on the open expanse of the lake, and how my legs were becoming tired punching into the snow. However everything was tempered by the beauty of my surroundings; the high, rocky hills were more defined in the snowy landscape. When I finally reached the shore I quickly covered the 70 or so metres until I reached the railway grade. I thought I’d walk a bit east until I reached the supposed site of the “town” of Gunflint and then head west toward the Narrows. Along the way I happened to notice something in the bush I’d never seen before…an old truck. For a few minutes I was puzzled as to how it could have got there until I realized someone could have done what I just did and cross over the frozen lake! 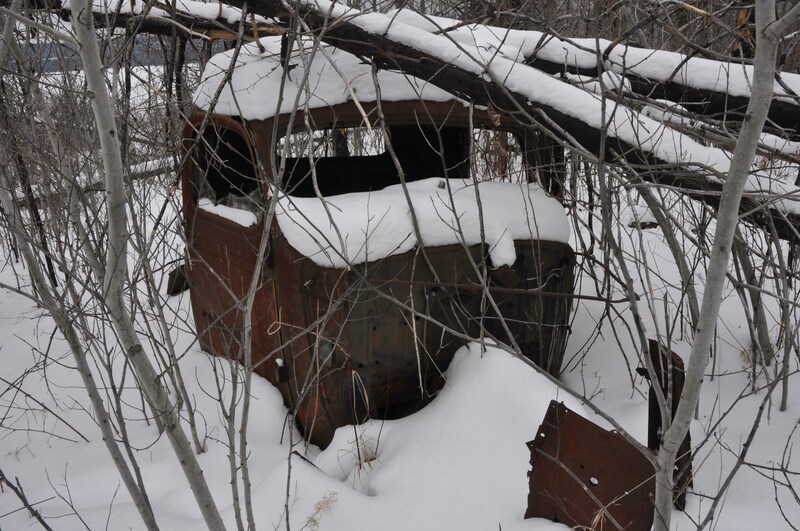 Abandoned truck, Gunflint Narrows, February 2013. Three hundred metres farther west I arrived at the narrows, unfortunately disappointed that the current between Gunflint and Magnetic Lake had prevented ice from forming; I would have to settle for snapping some pictures from the Canadian side only. However, the side effect of a dry fall and the cold winter was the lake level was the lowest I’d ever experienced. I was able to walk out very far into the channel and take some really neat pictures and video. Many of the bridge pilings, which are normally under water, were clearly exposed by at least 6 or more inches. Very interesting to see! 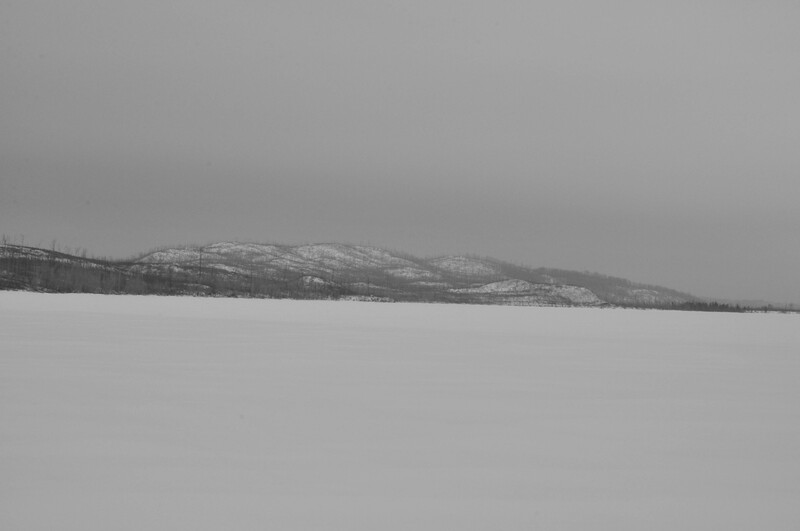 Soon it was time to head back to the lodge, but I did not relish the thought of the walk across the lake. It was just as cold as the way out, but the distance seemed a lot longer. By the time I made it back, I was pretty pooped. I only walked about 4k, but I had to work each step of the way…and there’s not even that much snow. My legs were a bit rubbery when I reached my cabin and I was glad there was some time to relax before dinner. The warm shower I had was the perfect remedy for my ailments. 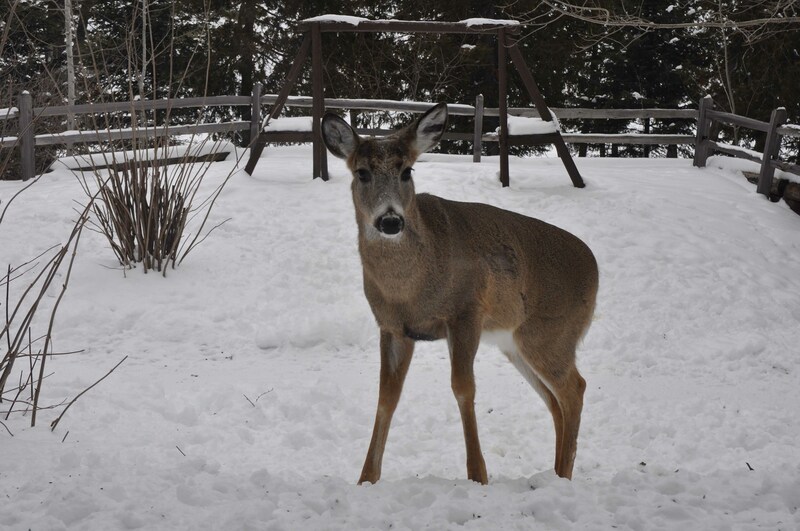 Creeper deer outside the window, February 2013. After a bit of relaxation in the lodge and a great prime rib dinner, it was time to prepare for the presentation. The talk was going to be held in the Conference Center, which was just across the road from the lodge. The air was a bit crisp outside, but I was sure sweating trying to get everything set up. I was scheduled to go on at 7:30, but people started rolling in at 7:00 and so I was kept busy chatting. That helped get my mind off of things. All in all, everything went very well (or at least I thought it did). There were about 30 people or so in attendance and they all seemed very interested in what I had to say. There were a lot of great questions afterwards and hopefully I did a decent job of answering them. I had a great time and the folks at the lodge were just awesome. Maybe if I’m lucky I’ll get a return invite at some point! It’s coming. It might not be completely discernible right now, but it’s on its way. I can’t wait. Not that I don’t like things right now, but it’s a much more preferable scenario. I’m sure I’m not the only one; there are many like me who are waiting. It’s even been foretold that its arrival is imminent. Confused? If you’re not, you know I’m talking about spring. Yes, glorious spring. 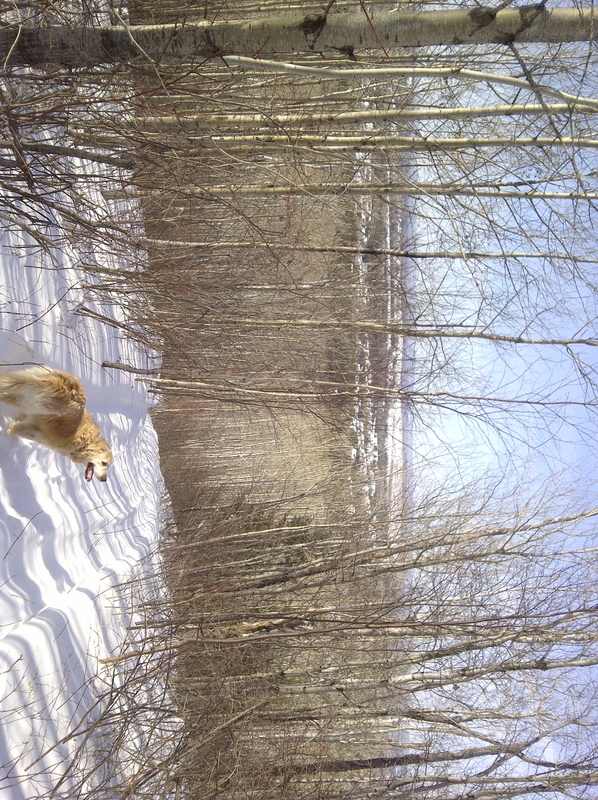 A time when the weather warms, the snow recedes and my yard smells like dog crap. As I gaze out the window I just know it won’t be long now. Even though it was a balmy -10C today (-19C with the wind), I know that soon enough we will be reaching positive temperatures on a consistent basis. The days are getting longer and the sun is getting warmer. It hasn’t been a particularly terrible winter (aside from the -38 a few weeks ago), but I’m just ready for it to be over. Over the last number of years February and March have been very warm, so I hope that trend continues. So with the beginning of February comes the beginning of a new semester. New classes, new faces and a fresh start; this job is always about change. It’s only day two, but things are looking good so far. My Grade 11’s are a nice bunch and it will be a great way to start the day. My Gr.10 Applied has lots of rambunctious boys, so they will be a handful at times, but I’m sure the content will keep them interested. I have been spending a lot of time preparing for my Gr.12 World Issues eLearning course in the last few days. I certainly have a much better handle on what I want to do, but it still is a big challenge wrapping my head around this new medium. The course material is all online, but as the teacher I need to decide how much of each unit/topic to cover and what assignments the students will complete. As they say preparation is 90% of the battle, but in this case there is going to be a lot of “on the fly” learning. Even though work is a little less hectic, as usual there are still a ton of things going on. Next Thursday we leave for the Glazier coaching clinic in Minneapolis and there are many things still left to take care of. It will be a nice diversion though, a little football to get my mind off school and railway stuff. Looking forward to it as well; it is a great coaching development opportunity. On the Friday morning there are 3 back-to-back sessions on the 3-5 defence, which is the scheme that our team runs. I should get a lot of good stuff from that. This clinic is also a nice program builder, as we have a chance to learn together as a staff. Tomorrow I have an executive meeting of the Silver Mountain Historical Society. We will be ratifying the new constitution for the society, which is the next step in the process to becoming officially incorporated. Unfortunately I’ve hit a bit of a slow patch with the whole Leeblain thing, as I am waiting on some action from the Ontario government. I’ve never worked with any type of bureaucracy, so I guess I need to understand that all of this takes time and things don’t happen overnight. However my plan is to be persistent, as keeping the pressure on will remind people that this is an important issue. Now speaking of Leeblain, my biggest railway news of the week is the upcoming presentation at Gunflint Lodge on Saturday. I spent most of my free time in the past week preparing for this event and I really hope I am ready to go. It’s always tough figuring out what to include and what to leave out; I want to stick to one hour so I hope I don’t go overboard. In the morning I have an on-air interview with WTIP radio in Grand Marais to talk about the presentation. This is the second interview I’ve done with these wonderful folks; the first was this past summer when I did the talk at the Chik-Wauk Museum. It’s such a great way to promote the event and my work, but just like Saturday I will be a bit nervous when the time comes. 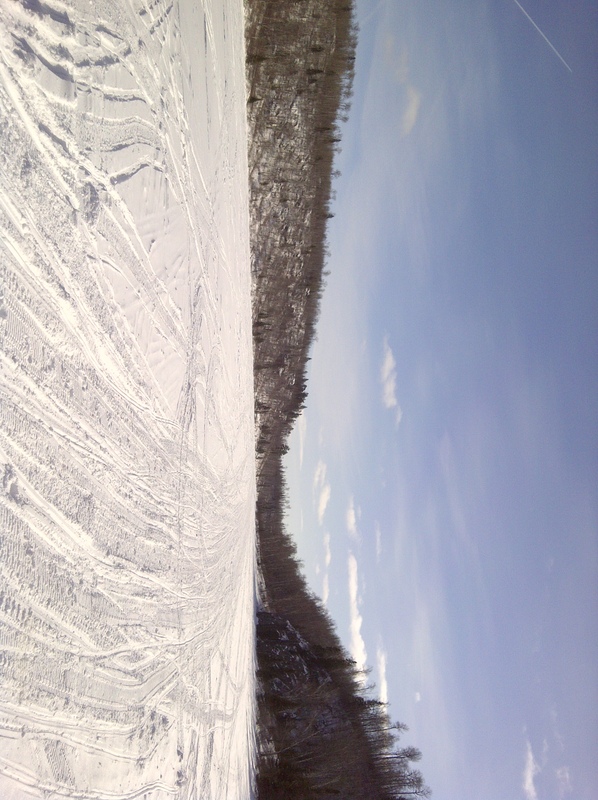 I certainly wish I could spend more time at Gunflint than the one night that I will have. I could have stayed Friday as well, but with the trip to Minneapolis the following week I didn’t want to be away from the family for two weekends in a row. However I know I will make the most of the time and take in everything that I can. If I’m lucky I will be able to do this again at some point in the future and maybe I’ll be able to stay longer. I’ll be sure to take lots of pictures in any event!